One of our favorite ways to use these green craft lights on white wire is to light up large glass blocks. 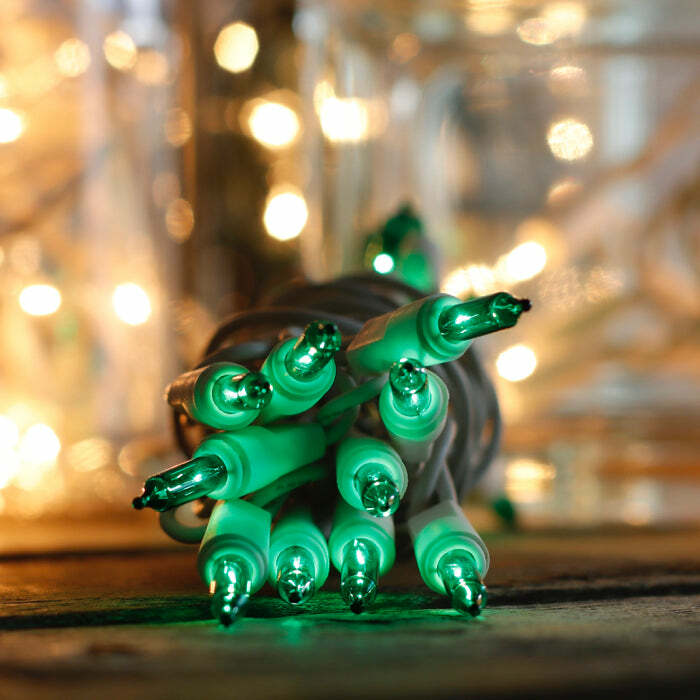 One plug, 8.5 feet of lit length and a 3-ft. lead wire make them ideal for constructing Christmas presents to decorate for the holidays. Gently fill a large glass block, found at most craft stores, tie a festive, wired ribbon around in a bow, and your Christmas gifts are ready to wow your guests. Be aware that incandescent bulbs do put out a certain amount of heat so it's best to monitor the containers and not leave them plugged in for extremely long lengths of time. Also use caution with them on sensitive surfaces such as antique furniture. If you are using these green mini lights in glass containers or vases, we recommend the white wire for blending in better with clear or frosted containers. Don't forget to combine these green craft lights with purple and yellow mini lights when you host your friends for Mardi Gras celebrations. Send us photos of how you are making your life more festive with lights! If I remove a mini light bulb will the others stay lit? Exactly what I needed for my Christmas Crafts.